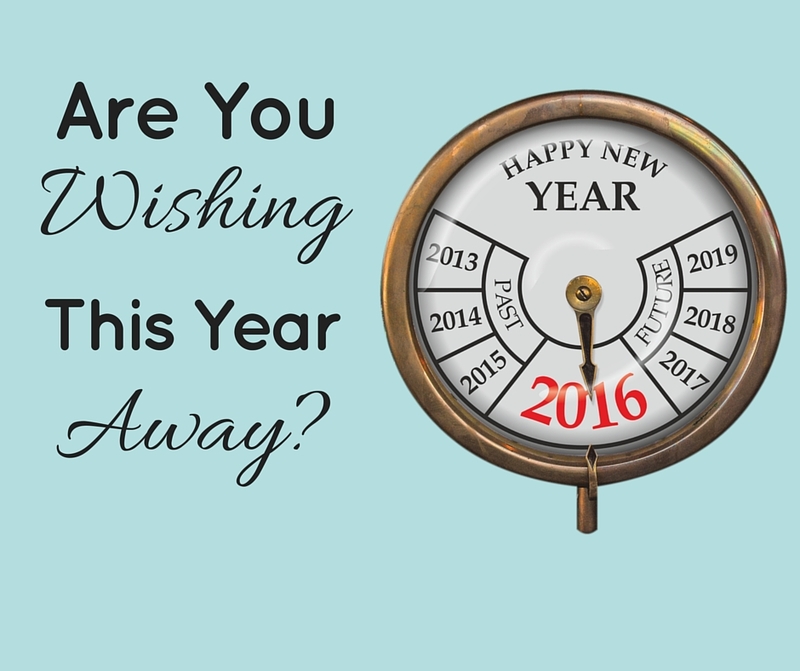 Are You Wishing This Year Away? STOP! Really. Just STOP. Take a big deep breath. In this fast changing world we all need to take a little time to just stop, reflect, take stock. It’s all very well making plans but before you go haring ahead through 2016 take a moment to stop and look back. Yay! You did it. You got through the year! Whatever your issues, challenges, achievements you did it. You got through them all. It might have been difficult or messy or a rollercoaster or great but YOU DID IT! What went well? Stop and recognize it – just for a moment or two. When you recognize and remember what went well or what was enjoyable, take a moment to remember it – visualize it and notice the good feelings you get. Give yourself a pat on the back if you like. What didn’t go well? You won’t need to dig deep for these, they’ll be there anyway, hanging around in your mind, maybe even still bothering you. What can you learn from this? Is there a project, idea, tool, piece of equipment or even a person that just didn’t work for you? Well, learn from it, then let it go! Do you need to recognize what it was? You don’t even have to know WHY it didn’t work, just accept it didn’t work or didn’t go well. (For me, my internet is not going well, as it’s a big part of my business with so much communication and marketing being online! I didn’t want the hassle to looking at changing it, but now I’m going to let it go and definitely accept I need to change provider). So, it doesn’t need to be a tangible thing – it can be anything. You might need to actually DO something to let it go / clear it out. If its thoughts or feelings then you could write them down and shred them or even imagine letting them go by blowing them up, chucking them in the bin, washing down the drain or anything else that works for you. All done? Good. Now you are ready. So, where do you want to go this year? What do you want to do or achieve? Pick your top 3 or top 5, not too many. Then break them down into smaller achieveable chunks. In coaching (and in business) we talk about SMART goals. Specific, measurable, actionable, realistic, timely. Write them down, find some words or a picture that represents them, or make a vision board, even better – tell someone! When we tell someone it makes us accountable! Whoever we tell will be able to ask us how we are getting on so we can’t just let those goals and dreams float by without ever actually getting anywhere near them. This year my top goal is to create some online packages in my work so that I can help more people feel so much better about their everyday life. This way, with online packages they are more affordable and people can use them at home in their own time without needing to wait for me to have space and time where our diaries can match up. There, I’ve told you mine and just made myself accountable – eek! Pick one word or phrase that you think you will need or that you want to be. Last year my word was STRONG. There was some seriously difficult stuff going on in my family this time last year and I knew I was going to need to have a lot of strength to see me through. I really didn’t feel strong at the time! So I looked for a couple of phrases, quotes and comments that included something about being STRONG. I stuck them up in my office and even changed them now and then throughout the year. 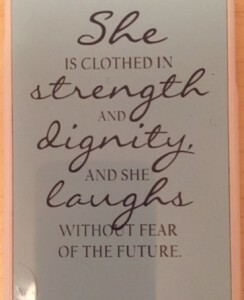 I even managed to get a phone cover with this nifty phrase on it, so it was in my sight at lot. Getting into the subconscious all the time is good too. You know what – they helped! Seriously, even I had some doubts when I started it. Yet just last week there were several times when people said to me they thought I had been very strong in dealing with what I have. So try it! Pick 3 – 5 goals for this year. Break goals down into achievable chunks. Pick a word or phrase to support you throughout the year. 10 Responses to Are You Wishing This Year Away? Real thought provoking blog. Thanks for sharing. Appreciate you taking time to read and comment. Keep those good thoughts going! I love the idea of taking time to look back and reflect on what went well. As I read this paragraph, and did look back, I really did get those warm feelings you talk about! My smart objective is to start using all my knowledge and experience as a self-employed consultant – ad I’ve set myself the target of earning some money this way before the end of March. Yikes! There – I’m accountable! I’ll work on a word or phrase to support that aim. Good luck with the on-line packages. I look forward to seeing them. Glad the look back helped – it’s so easy to forget to do that. When you are using your knowledge you will need to look back and draw on that experience too and so keep remembering that feeling you got – even when you think you don’t need to. Good luck for your targets. Come back and let me know how you get on! Great post Emma. My food writing means that I spend a lot of time looking at how our ancestors lived and winter was seen as I time to hunker down, take stock and get ready for the energy of spring. I try to remind myself of this when I’m placing pressure on myself in January. Thanks so much for reading and leaving a bit about your work too. It’s interesting isn’t it to see how things through the ages still have an impact! I’ve had a problem being able to respond to comments, so since you left this, I do hope that you’ve managed to get through the first couple of weeks of January without the added pressure. My word for 2015 was strength too. This year I am going for transformation as I make changes in my personal life and take my business to the next level. Ah good Reminder to do this. I did mean to pick a word but it never really happened, oo I’ll get thinking! I’ve had a problem being able to respond to comments, but it seems to be working now, so I wonder, if you come back and see this response, did you managed to pick a word for your year? Choosing words, isn’t everyone’s think, but it is something I like to do. Hope you find one.